Here at Smoky’s Tobacco and Cigars, we specialize in the excellence of the all around tobacco experience. We believe a great cigar or pipe, good conversation in the company of friends, and most importantly relaxation is why we exist. While picking out your favorite cigar or buying that special gift, we invite you to relax with one of our 70 specialty beers or a soft drink. Lounge in a rich leather chair, reflect, relax, or participate in the fine art of conversation. Smoky’s will make your experience a relaxing one. Smoky’s founded in 1983 has served Knoxville, TN continuously for 31 years. 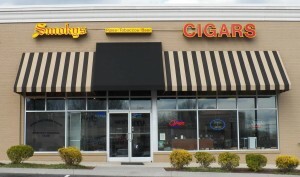 The new age of Smoky’s Tobacco and Cigars came to life in March 2010, when the Dave and Jeff expanded to its current location. We maintain high standards of quality, a knowledgeable staff, and a comfortable, friendly atmosphere. We are looking forward to serving Knoxville’s Tobacco and Premium Cigar needs for a many years to come! Choose a cigar, then stay for a stogie and hang out with friends, colleagues, or Smoky’s regulars. Kick back and watch a game in one of our leather chairs while enjoying our 70”HD Television.